The regulators wish to ensure that competition is alive and well within embedded networks by making it easier for customers to access retail market offers. To that end, a new energy rule came into effect on 1 December 2017. Most of the mechanics of that rule relate to improved management of the metering within embedded networks. 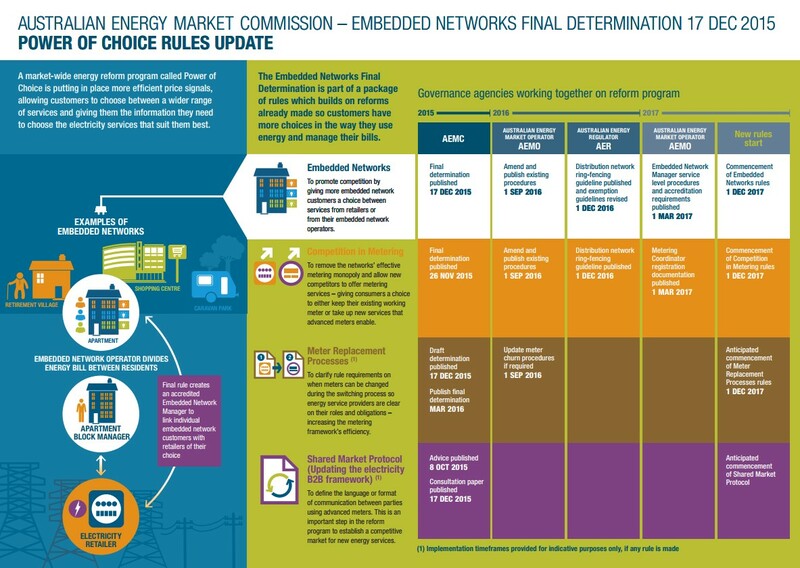 To save you reading it chapter and verse, the AEMC have produced a succinct summary in an “information sheet” accompanied by an infographic (see below). specify which embedded network operators are required to appoint an embedded network manager. In practice, this will mean that in most embedded networks there will be someone charged with the responsibility to sort out the metering. This Embedded Network Manager will be a market participant who is registered with the market operator to keep the central information systems up-to-date with metering details. The responsibilities in detail are shown in Appendix A. Ever since WINconnect attained market participant status as an electricity retailer with access to CATS and MSATS, we have essentially performed this function as a matter of course. The introduction of the ENM category will greatly benefit the industry and streamline the data management aspects of competition within embedded networks.